There is a choice of hotel-style rooms and suites which are on slightly raised ground and are 2-5 minutes walk to the sand. Alternatively, there are stand alone villas which have multiple rooms, private pools and a butler service. Please refer to menu above for more detailed information on the accommodation (Parrot Cay Accommodation). Parrot Cay is located in Turks and Caicos just a one hour flight from Miami. The island capital is Providenciales and the airport is well connected with the USA and Europe. From the airport it is an easy 35 minute speedboat transfer to your private getaway. Parrot Cay is a five star luxury resort located on a private island in Turks and Caicos. It offers hotel style rooms and suites or fully equipped villas with a private butler service so there is something for everyone. It is situated on 1000 private and unspoilt acres with a mile long white sandy beach. The resort features the region’s best spa and haute cuisine, and the personal service the staff provide is world class. There is a variety of accommodation to choose from ranging from hotel style rooms and suites offering a garden or ocean frontage. Alternatively, if you are after a little more space and luxury why not stay in one of the villas in Parrot Cay Estate. Choose from three or five bedroom villas which all have a private swimming pool and their very own butler service! For more details please refer to side menus on accommodation. 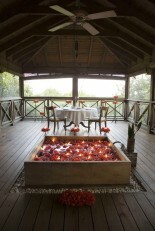 Parrot Cay is renowned in the Caribbean for its innovative Asian, Mediterranean and Como Shambhala spa cuisines. The Shambhala cuisines focus on organic produce and nutrition and offer freshly extracted juices to the guests. Most food is raw, and there are no dairy foods included. Restaurants Lotus and Terrace offer an amazing mix of Asian and Mediterranean dishes and there is an excellent room service menu to supplement this. Please contact us for more details for packages that are on offer. Watersports including diving, snorkelling, deep sea fishing, wind surfing, and catamaran sailing. There is a fully equipped gym in the resort with free weights and cardiovascular machines. The staff can also arrange inter island excursions - for example a visit to Iguana and Sand Dollar Islands. Other resort facilities include two flood lit tennis courts, a 5000 square feet infinity pool, and hiking trails. There is a comprehensive library, pool tables, internet terminals, satellite television and Playstation consoles.